I recently came across a verse in scripture that really changed my life and perspective on food. But here’s Paul just speaking right to me (and probably a lot of you too!) 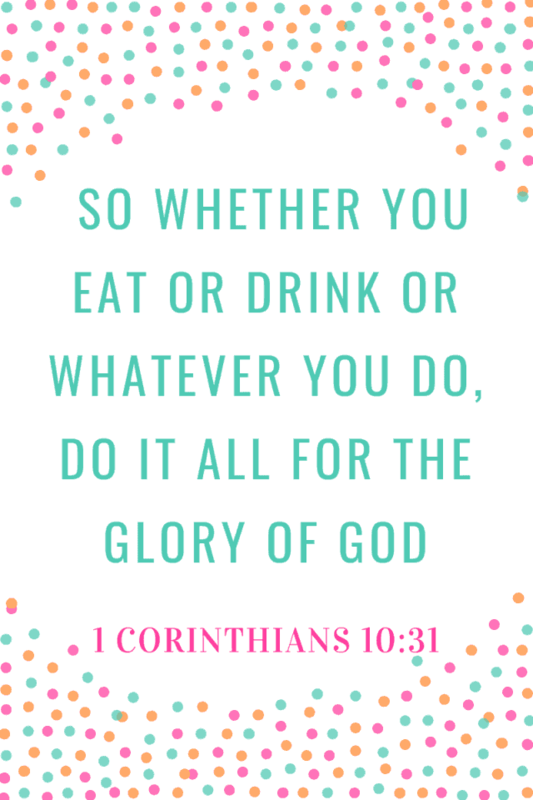 that our food and drink choices are ALSO to glorify God. OH MAN. WHATEVER we do? THAT IS TOUGH. Maybe you can even use that time to really thank God for how He has blessed you. There are people that have no clothes, yet we have the “problem” of folding SO many. Thank you God for provision! Obviously, it’s not always easy to do super boring things for Gods glory, but if we dig down we can find ways! Not saying I am perfect and do this all the time, but it’s something I have been TRYING to get better at! Good thoughts and insights. Like the FEAR acrostic. Thanks for sharing. I’ll remember as I’m scrubbing the bathrm.! Haha! Yay! Thanks for reading Anne! Hi Taylor! I too have struggled with eating disorders in the past. Have you ever heard of Revelation Wellness? I found it a little while ago and it is a GAME CHANGER. Such an incredible approach to fitness, nutrition, and life through the lense of the Gospel. They have a 7 day detox (has NOTHING to do with food) and podcasts that are amazing. I strongly encourage you to check it out! (And no, I don’t work for them! It’s just changed my life 🙂 God bless you! Thank you so much Anne, I’ll try to look them up! Hello Taylor, as always these Sunday reminders are Awesomely Fantastic!!! I just wanted to wish you, and those you care for, and about.. a Wonderful, Happy Thanksgiving. In Giving Thanks, Thank You for your Spirit Filled social outreach. It is very rare, very admirable, very helpful, and not unnoticed. May God Bless You many times over!!!! Thank you so much Michael! Happy Thanksgiving! !